Station sign on the downtown platform at the 21st Street-Queensbridge station. Resized photo courtesy of Eye On Transit. Updated, 10:35 p.m. | A gunman who tried to improperly enter a subway station in Long Island City, Queens, shot and seriously injured two police officers around 5:15 p.m. Tuesday as they tried to arrest him, the authorities said. The injured officers were taken to Elmhurst Hospital Center. The gunman, who was shot four times by a lieutenant as he tried to escape, was taken to Bellevue Hospital, where he admitted his role in the shooting, the police said. 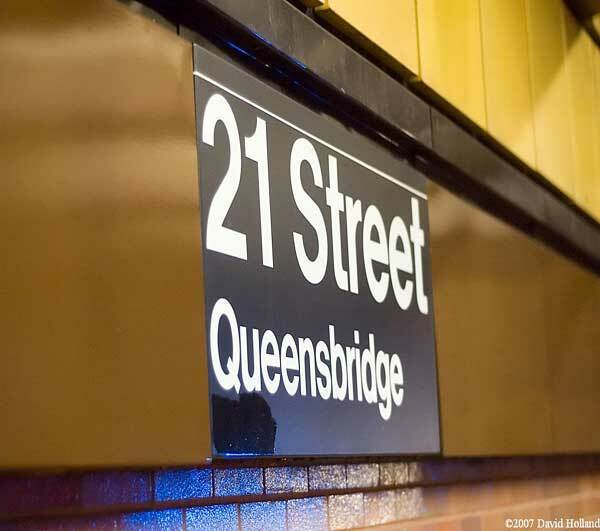 The shootings occurred inside the 21st Street-Queensbridge subway station on the F line. Well into the night, F trains bypassed the subway station in both directions as the police investigation continued. As of 10:29 p.m. the Metropolitan Transportation Authority continue to warn passengers of delays in service along the line, which travels between Jamaica, Queens, and Coney Island, Brooklyn, via Manhattan. The two officers, identified as Shane Farina, 38, and Jason Maass, 28, were assigned to the Transit Bureau.